I’m really getting sick of drywall dust. We did our best to put up plastic and keep the house safe from dust, but there is no escaping it, it is everywhere. Luckily we are getting really close to the end of this stage. We are about a week from having most of the drywall done, with the exception of the soffits that will need to be built around the HVAC duct. Getting the new HVAC run into the house, upstairs and down. Our metal railing for the instrument storage room arrived and was installed this week. 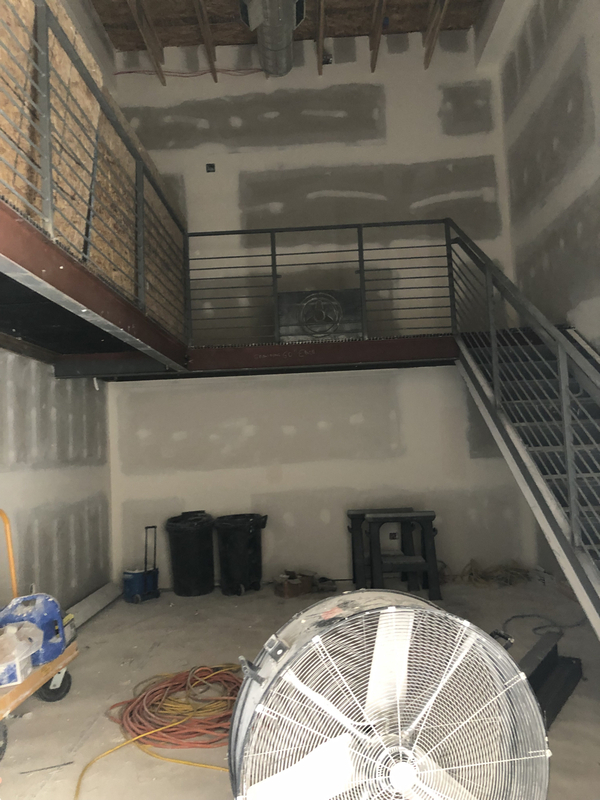 We also got the railing for the stairs into the lobby from the house but they have to re-do something about it due to it not meeting ADA requirements. The instrument room with the railing installed. We removed the metal grid that fills this opening between the house and the new space in order to have some metal trim installed, expecting that to return tonight. 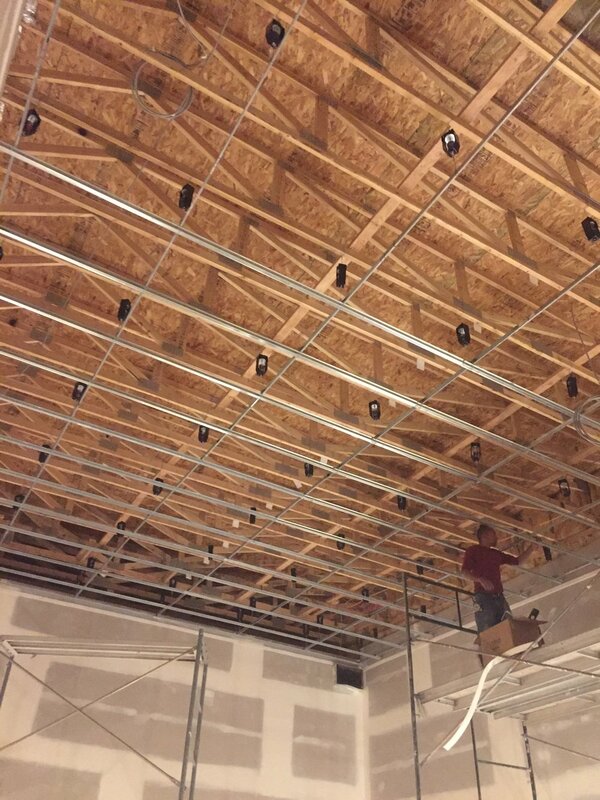 Tracking room 2 with the ceiling grid hung and ready for sheetrock. First of three layers of sheetrock going up in tracking room 1. First layer going up in control room 2. Tracking room 1 layer #1 finished and starting layer #2. Tracking room 2 ceiling complete minus final taping/mudding. Power for lighting in the tracking room 2 soffits above the door into the sound lock. Control room 1 sheetrock complete minus taping and mudding, and my son Truman. Are things getting closer to being done? I think the end is in sight but the extra costs are mounting and I can feel that it’s going to take some real fortitude to get through these last few months. Not sure how to better explain, but at this point we just keep moving forward and hope for the best. We got the fire pit back from powder coating and got it placed. I have the burner and rocks and stuff for inside but just can’t find time to get it all installed. 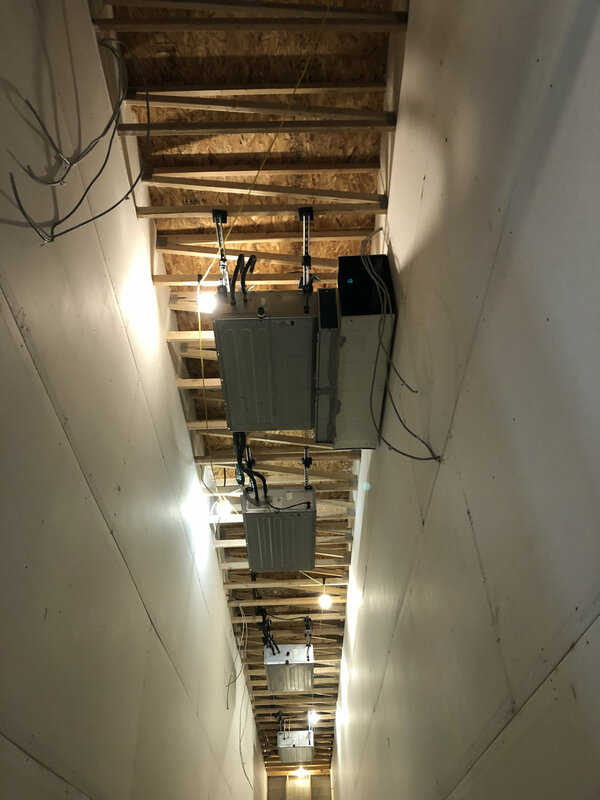 We made the decision to upgrade the hvac in the house as part of this whole process, so this week they started installing mini-split systems on both floors. The original system was quite old, noisy and very inefficient. Setting the compressor for the house mini-splits on the roof above the new lobby. Sheetrock in the lobby is nearly finished and ready for paint. Lots of sheetrock sanding this week. Despite our best efforts the dust is everywhere, not just in the new building but in the house as well. Looking forward to this phase being complete. Sheetrock ready for paint in the hallway. The Muta hangers finally arrived from Kinetics Noise Control. These isolators are what the ceilings in the studios will hang from. Starting to install the Muta hangers in tracking room 1. After figuring things out the guys moved pretty quickly. The grid set up and suspended in tracking room 1. Three layers of 5/8” sheetrock will be screwed to this grid forming the ceiling of the studio. The crew started by hanging tracking room 1 as it was a rectangle and level, now they are moving on to control room 1 which is a sloped ceiling and not quite so full of right angles. Setting the grid around the hvac has proved to be a bit of a hassle for the guys. Things are continuing along, mostly landscaping and sheetrock again this week although they made some strides with HVAC as well. Definitely one of the highlights was getting to see the new entrance without an outhouse in the way. I’m really happy with the way this is shaping up, we still have some trellises to install as well as some patio furniture to dress things up. Still waiting on the gates and some more sod but the landscaping is nearly complete. To make myself feel better about our progress I’m including some photos of the same area from last September. Jared (superintendent) and I have been discussing how to clean up the large opening between the new space and the house. 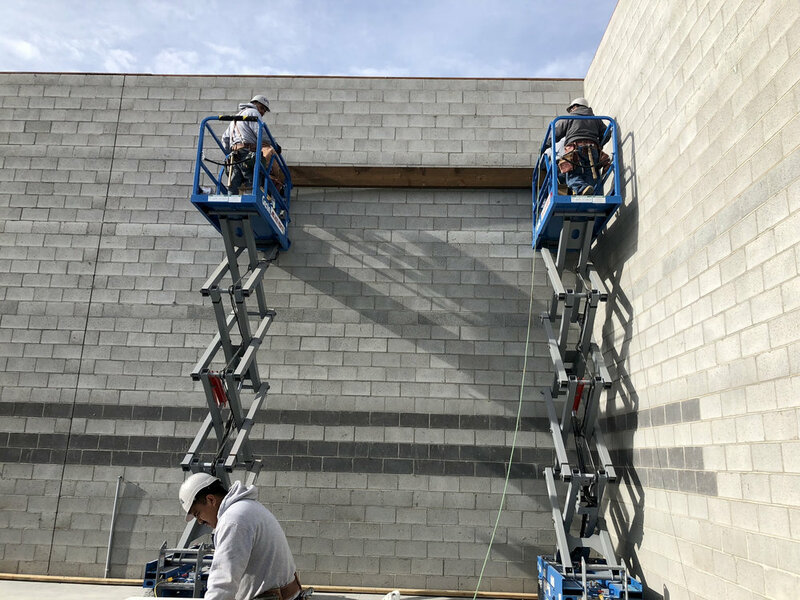 We had pretty much settled on the idea that we would need to bring in some sort of masonry saw and make a huge mess in order to clean up the brick around the edges and make it so we could trim it out. One day the masons happened to be around and told us that with this adobe brick a simple chisel and hammer would take care of anything we needed done. Much easier and also a little disconcerting. HVAC duct coming into the space above control room 2. 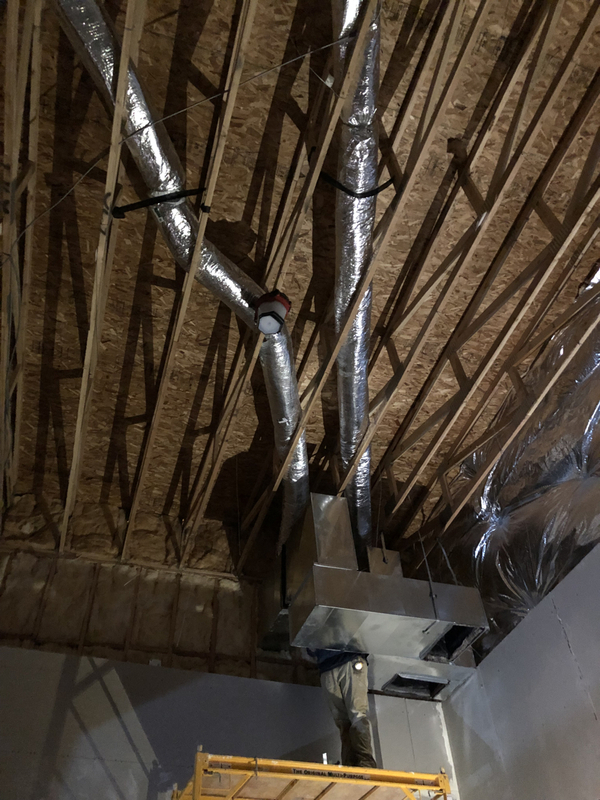 It’s a very tricky space to maneuver the ductwork through as they need to stay clear of the wire hanging from the trusses that will hold the ceiling structure. 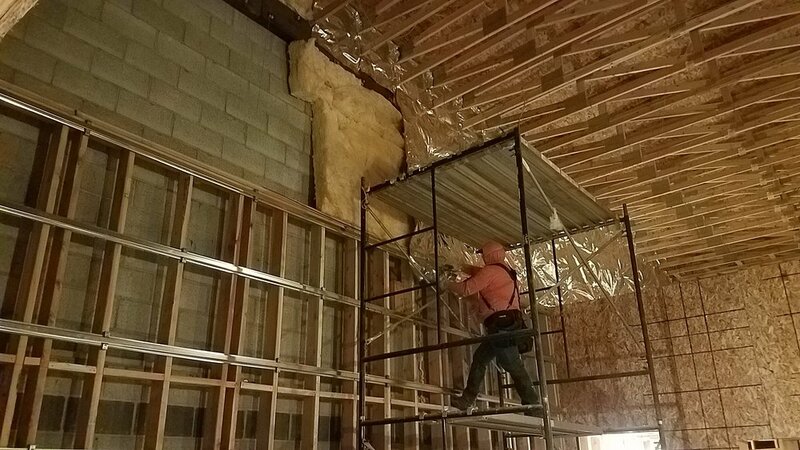 It took a few days of working and re-working, not to mention a very close call when the scaffolding fell over and took one of the workers down with it, but they got things routed and ready for the ceiling to be built. You can see the feed and the return ducts as well as smaller ductwork coming off up high to feed the studio 2 machine room. The same basic ductwork seen above control room 1. Duct work leading in to tracking room 2 with the smaller lines feeding isolation booth 2. 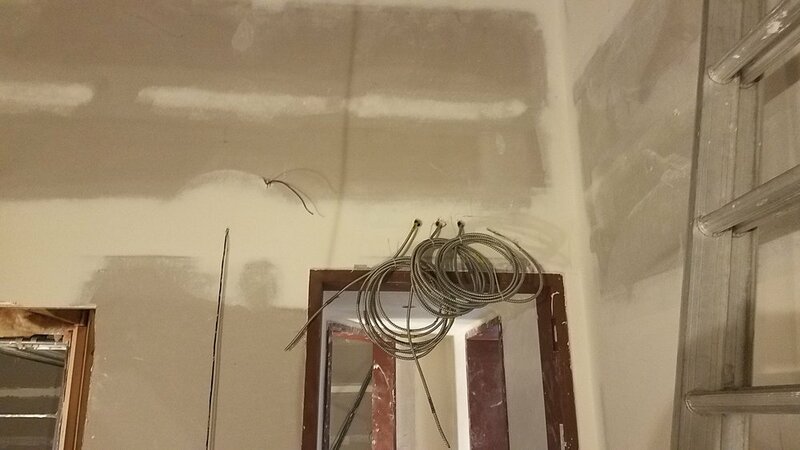 The drywall company ran out of iso clips twice and they can be a bit tricky to come by. Once the second shipment arrived the final track was installed in the isolation booths of studio 1 allowing the final sheetrock to be hung. Track and sheetrock going up in studio 1 isolation booths. Drywall finished in the studio 1 iso booths. You can see the 2 layers on one side of the wall and the clips and 3 layers on the other side. Looking out of the iso booths back toward control room 1. Sheet rock and landscaping this week. They are nearly done with the third layer of sheetrock everywhere now so I suspect they will start working on the ceilings soon. Turns out hanging the 3rd layer of sheet rock looks a lot like hanging the 2nd layer. What is really notable in this photo however is just how sketchy it is to be standing on a piece of wood resting on a ladder leaning against a wall 16 feet up. Another sketchy drywall hanging invention. Third layer going up in tracking room 1. The lobby sheetrock is coming along as well as the studios. This is looking toward the bathroom and the hallway to the studios. Track going up in the sound lock into control room 2. 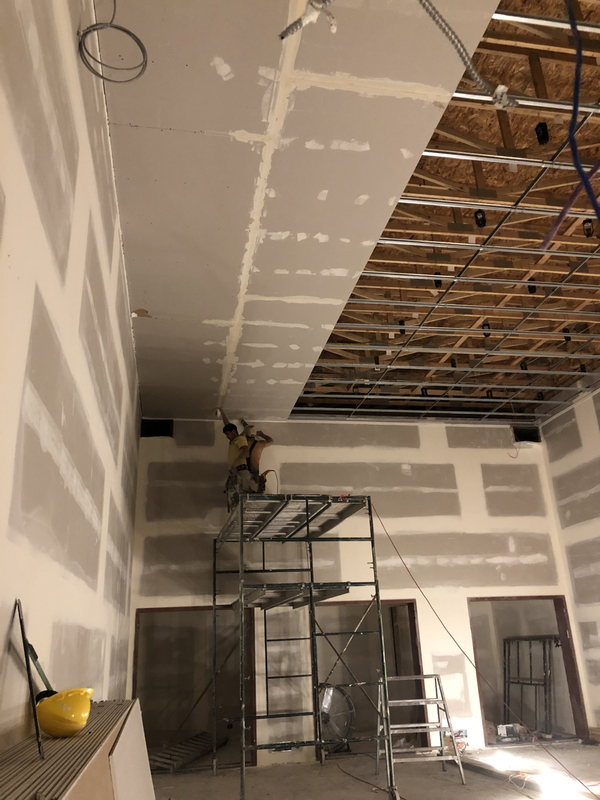 The drywallers ran out of the iso clips so a few smaller spaces, iso booths, have yet to even get the track, not to mention a single layer of sheetrock. Looking out of control room 1 you can see the 3 layers of sheetrock between the window and the speaker cutout. Tracking room 1 looking toward the window into control room 1. Control room 2 and machine room 2. The speaker boxes have not been cut out of the front wall yet. 3rd layer going up in the studio 2 iso booth. One of the drywall crew workers spends his entire day cleaning up behind the guys hanging the sheets. Still, every day the hallway goes from empty to this. Sheetrock was already hung in this area above the lobby. You can see the remains of the old house up behind the steel beam. The roof continues to leak and despite days of trying they have yet to track the entry point down. So they’ve torn the sheetrock down to do more investigating. Flooding the roof above the lobby to try and find the leak. My son Brenden came back to finish the welding on the fire pit which is now ready to head off to powder coating. Landscapers were back adding lighting, and working on the fence. The fence looks great and I’m really happy with the way the front yard is starting to feel. Looking forward to the plants growing in. Spring is approaching and we have more rain and less snow around here. We are starting to get studio bookings that could be after the new spaces are open, but it’s still pretty hard to know exactly when that will be. The electricians got the house transferred over to the new power service which means we were able to say goodbye to the awful looking temporary power pole out front. The exterior ladders showed up making it a lot easier to get on the roof when needed. One really talented architect that we met with very early on told us that while he was interested in our project, he wasn’t interested in working with the old house. He recommended we tear it down, as tying a new building to the old house would be too problematic. I’m definitely glad we kept the house but there have been a few glitches. We’ve had a lot of rain lately and leaks where the roof of the house joins the roof of the new building. At this point we have all but one very elusive leak eliminated. The warmer weather brought back the landscapers who managed to get just about everything other than sod done this week. Also, how I wish this outhouse was not in the middle of our new entrance. The new fence posts are in and once everything is done they will bring the wood slats to complete the fence that surrounds the front yard. Duct work continued in the studios. This is the main feed line entering above the iso booths in studio 1. Sheet rock showed up, a LOT of sheet rock. We have piles like this in most rooms of the studio and we don’t even have it all yet. First layer of sheet rock goes up in control room 2. More sheetrock in control room 2. First layer going up in studio 1. You can see the hvac duct coming through the top of the wall above the iso booth door. The ceiling will hang just above that duct. The instrument gallery sheetrock was finished quickly. The other wall of studio 1. All three layers of 5/8” sheet rock will be taped and mudded. 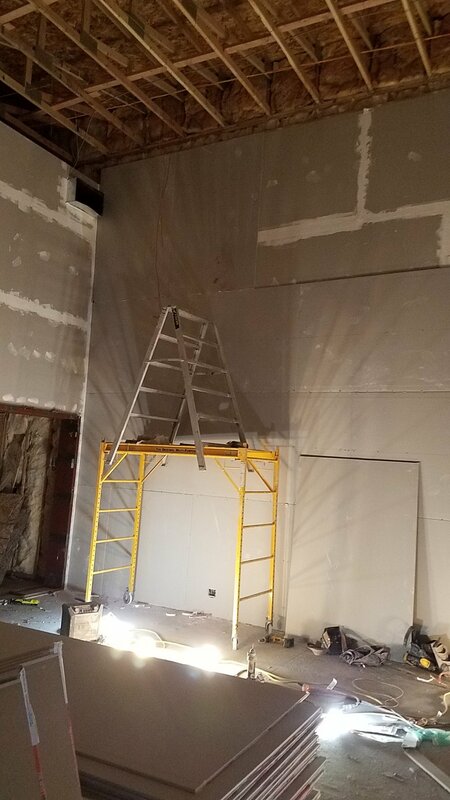 The second level of sheetrock is going up in studio 1. The seems are staggered and the corners are lapped. The opening on the right is the window into control room 1. Preliminary wiring (electrical, audio, network/security) is finished and we are now heading into weeks (months?) of sheetrock work. In most cases walls have 3 layers of taped and mudded 5/8” sheetrock per side, although some walls only get two layers. Regardless it will take a while to complete. We remain busy in the “house” studio although with the temporary wall out back removed the construction noise is encroaching. I’ve begun to lose sleep due to worry about how we are going to afford to keep the doors open, but at this point, what can you do but move forward? This is looking down in the space between the front wall of control room 2 and the tracking room wall. The black cable comes from the trough under the console through the pipe and then up into the walls to connect to the mic / tie line boxes throughout this studio space. The red and black lines coming from the panel on the left are instrument and speaker level lines that tie into a box in the control room. The Overly door frames arriving. Moving the studio 1 iso booth door frames into place. Studio 1 iso booths with door frames. The door into studio 2. My son has been working on a project in his woods class for the studio. We ordered a huge slap of walnut and a bunch of epoxy and he has been constructing this table for our instrument gallery room. There is still a lot of planing and sanding to be done but it’s going to look great. This is upstairs in the instrument gallery. The insulation company was set to arrive on Thursday so Wednesday afternoon Jared (superintendent) and I did a bunch of extra blocking to give a sturdy backing to the guitar hangers for the room. This is the idea, although we won’t have quite such an amazing collection as what you see here. Thursday evening the insulators had already finished half of the studio space, the upstairs is where all the guitars will hang, under the mezzanine will be drums and amplifiers. Tracking room 1 looking back to control room 1. The doorways into the machine room (right) and the sound lock (left) were framed incorrectly so the door frames are hanging out waiting for a fix. Just getting the insulation in place suddenly defined the rooms so much more. It is now easier to get a sense for how the different spaces feel. This is looking out of iso booth 1 in studio 1. Looking into iso booths 2 and 3 from iso booth 1. Things are creeping along, there is still so much to do, and so much that can be done but we still have days where only one sub or even none show up. Our contractor is frustrated and working hard to get them out but there is so much building going on that it makes it hard to keep subs on site. Fedex showed up with a ton of cable in anticipation of Canova Audio arriving from North Carolina. The Fedex guy was all put out that there was so much and insisted that we pause our session and all come out and help unload the truck. That seems weird to me, isn’t that his job? Thom Conova and Roger Gupton arrived on Monday for 9 days of mounting tie line boxes and running cable. You can see the black tie line box mounted in Iso Booth 1 in Studio 1 and the silver tie line box mounted on the wall of the live room. 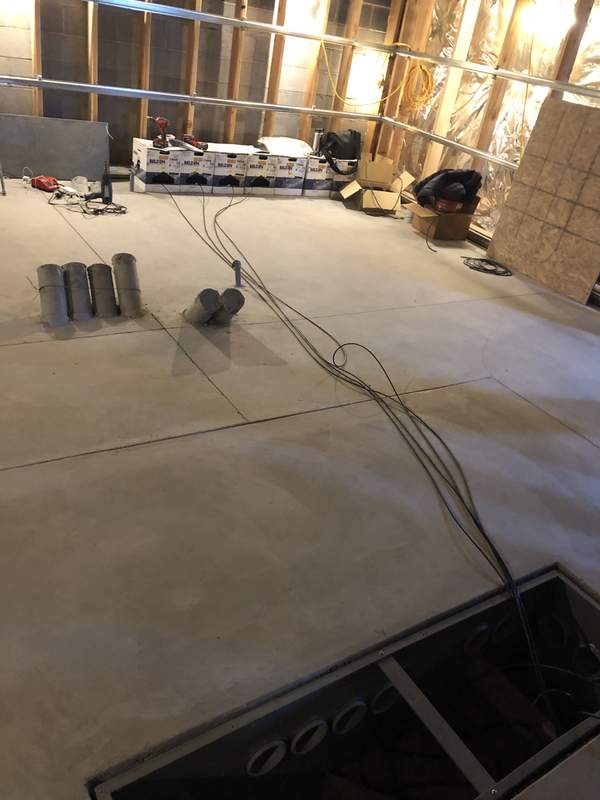 In addition to mic lines and many cat 6 lines there will be lines from the live room to the booths for guitar or speaker leads. Cat6, quad and eight pair mic line cable. Roger tying the lines up. 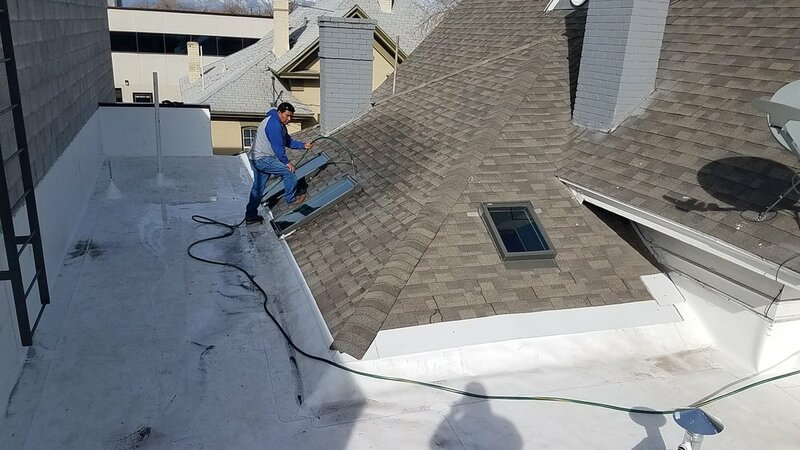 These guys do very tight, very clean work. Cat 6 and mic lines run into Iso Booth 3 in Studio 1. Thom cutting in a tie line box. 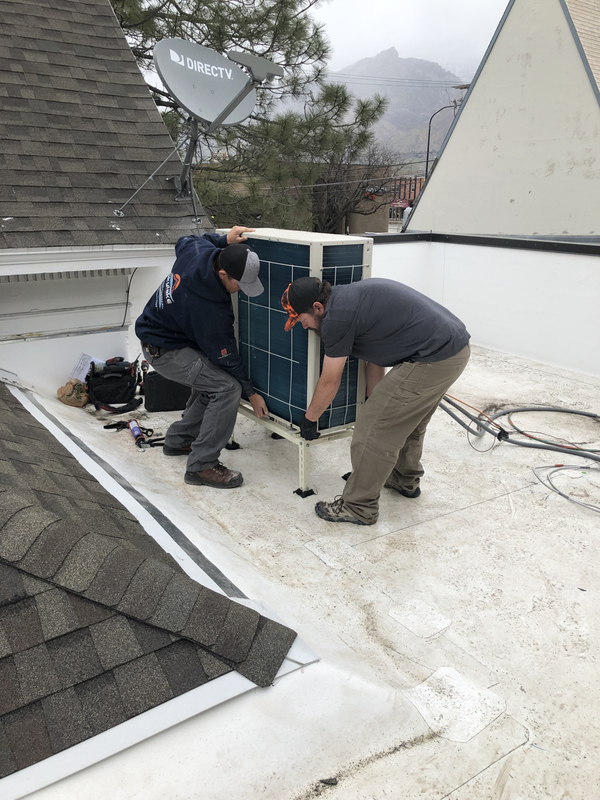 Provo City Power came out and got the new power service up and running. We are still on temporary power for the time being, but we have power into the new space awaiting the electricians finishing off the rough electrical. The large copper cables coming up out of the ground are from the ground rods and the ufer in the foundation. These are tied to the panels through the large copper plate. Penetrations were put into the roof for the HVAC lines and venting. Just above the lift you can see the steam humidifier that is being installed in order to raise the humidity of the instrument gallery. Hvac duct in the instrument gallery. The framing in the center of the photo is underneath what used to be the ceiling of the house porch. The old bead board had to be ripped out in order to get the electrical re-routed from the old panel to the new. 9 huge crates showed up with the Overly acoustic doors. The frames will be installed starting this week. We removed the temporary wall that separated the future lounge / kitchen which is in the rear of the house from the hallway of the new space. It was exciting to get a sense for how these two spaces will work together. Looking out of the lounge into the new hallway. Last week was filled with more rough electrical, hvac, insulation and network/security wiring. We passed our ‘power to panel’ inspection so we are just a few days away from having power out in the new space and being able to swap the house power over to the new distribution panel. I spent a fair amount of time this week thinking about and discussing colors and finishes with Wes. I tend to be pretty particular with color and I’m really worried about getting it wrong, especially considering that what you see in the control rooms will be almost entirely wood or fabric, and fabric panels are a lot harder to change than paint. Wes has so much experience designing studios and refining things to make these very odd shaped spaces feel natural and normal and it’s easy to just want to throw colors all over without thinking through just how that will feel when you are in the studio day after day. 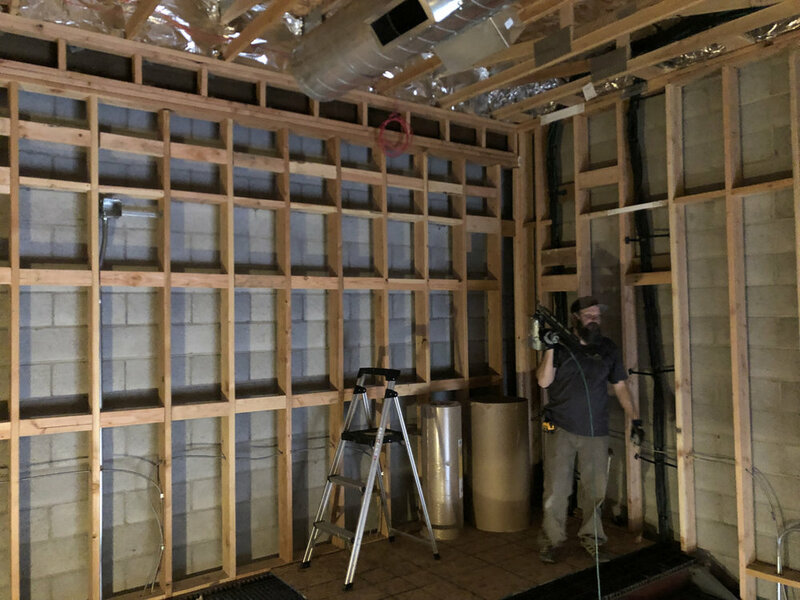 I think at this point we are pretty close to having things pinned down and with no time to spare, Tony Brett is diving into building our acoustic panels. Tomorrow Thom Canova will arrive to spend a week doing the rough/pre-wiring for the lines that go in the walls. 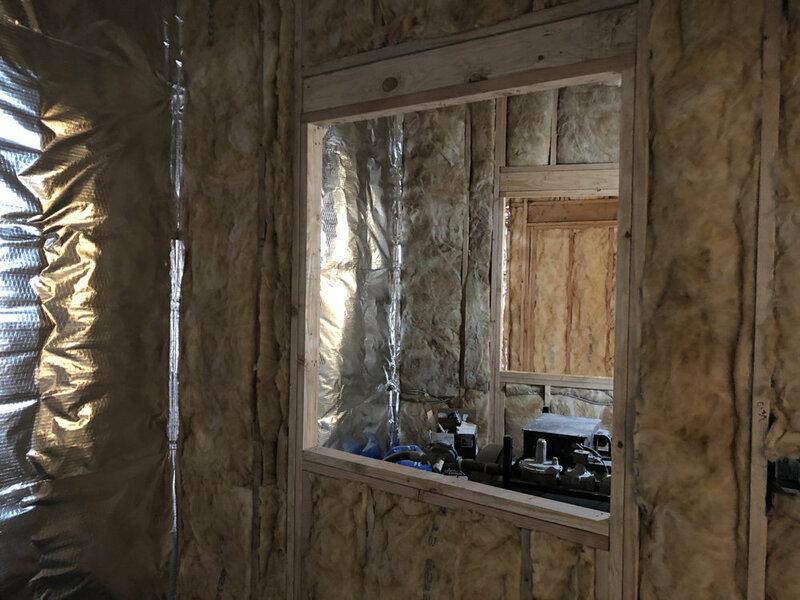 After that insulation in the walls can begin and then straight into sheetrock. This panel on the side of the house is the main disconnect between the transformer out front and the inside panels. This is the main distribution panel inside. Power comes in the bottom and then is split via the three breakers to the house, the dirty power for the new space and the clean power for the new space. The main distribution panel on the right, the new panel for the house in the center and the dirty power for the new space on the left. This is the clean power panel for all the outlets in the new studios. This is fed from the isolation transformer that was hung up last week. 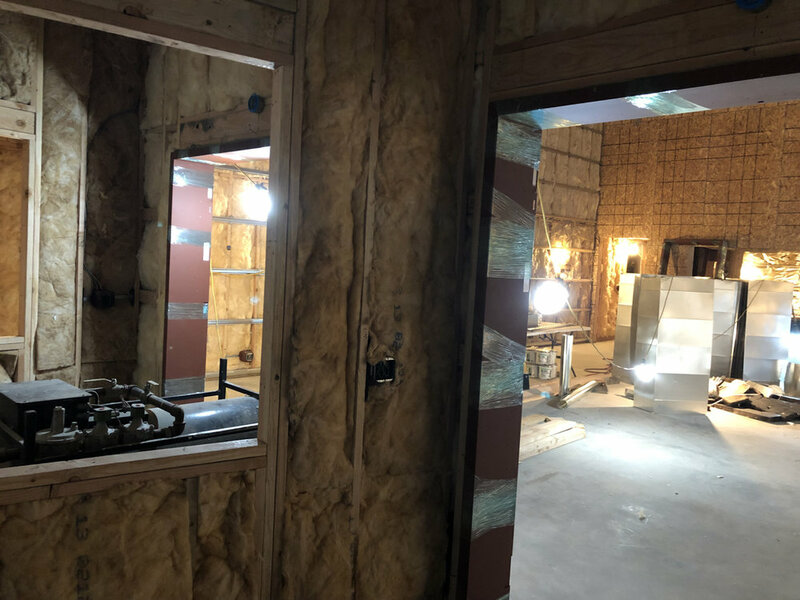 This small mechanical room is getting very full now that the panes are all in place as well as the hvac unit for the lobby and instrument gallery. Insulation of the exterior walls continued this week, this is above studio 2. Insulation along the outer wall of control room 1. Ductwork continues in the center hallway. Penetrations have been cut into the studios. At the top of the frame you can see the duct with a rubber vibration isolator. This will help stop vibrations in the units from reaching the ductwork. Here the duct penetrates the wall above studio 2. Another set of rubber vibration isolators will be just inside the walls to further quiet any noise from the hvac. Our canopy out front was framed up this week as well. Honestly, i don’t know how I feel about the music industry as a whole, but I know that there is a lot of great music being made here in Utah and we are lucky to get to be a part of it. We have remained busy for a long time now and while this really is a crazy business move, I’m really happy to be able to do what I can to provide this great music scene with such a place. We are lucky to have Wes Lachot, Tony Brett and Thom Canova on board and frankly doing us such a favor by working long and hard on a project with some pretty big budget/time constraints. 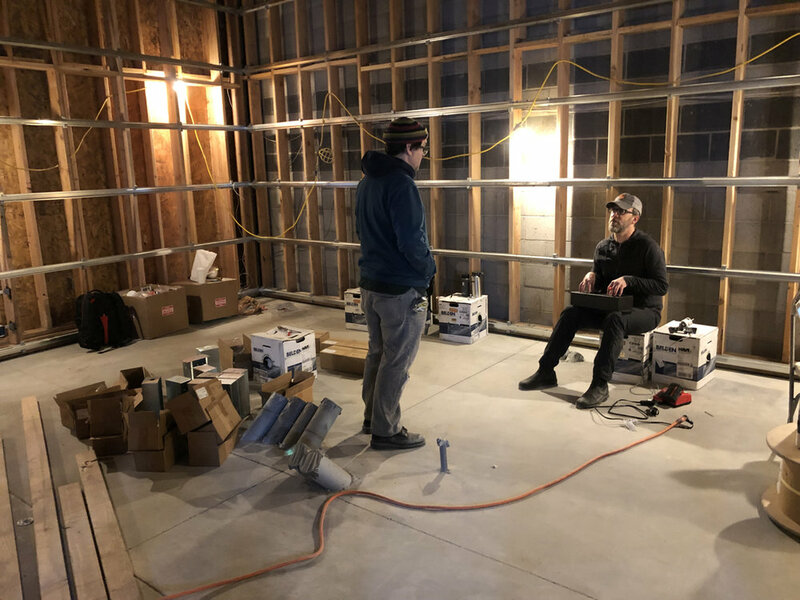 They are working closely with our great contractors at Zadok Construction (Nick and Jared) to build a pretty amazing studio space. These are just the artists we’ve worked with in the past month. The 2nd level of the instrument storage room is nearly done, just need the railing now. Looking into the hallway from the 2nd level. Glass sliding barn doors will hang in the opening. Spray foam insulation in the lobby where we didn’t want to lose the space that a traditional framed wall would eat up. More work was done on the HVAC system until about mid-week when the guys came down with a pretty bad flu that is going around. Hopefully we will see some real progress next week. In front of the lobby we got the missing piece of steel for the canopy. The last few weeks have been primarily about electrical. I’m very impressed with the electricians and their attention to detail. At this point they are a few days away from having all of the rough electrical finished. This is the transformer that will clean up the power for the studios. 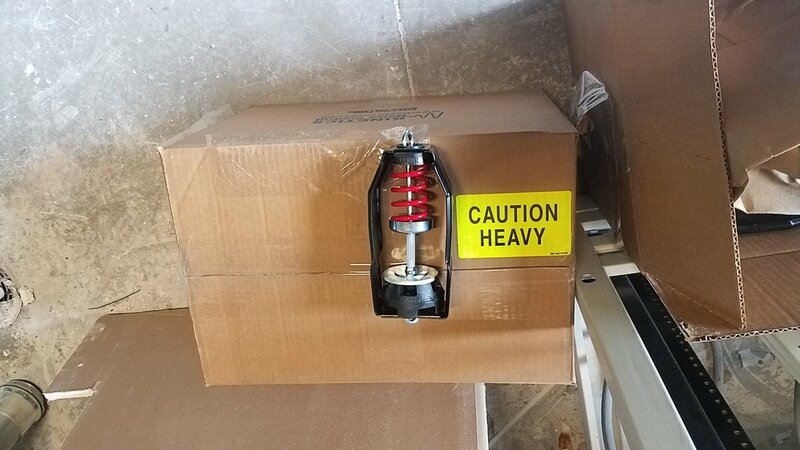 This box is so insanely heavy that none of us could even get a corner of it off the ground, yet it needed to be hung up to be put to use. Chains and pulleys got the transformer hung and ready to be hooked up. The electricians take great care with their installation. Here he is precisely bending conduit that will be hidden behind sheetrock and never seen again. This small room has so much electrical equipment in it. On the left is the panel for the “dirty” power of the new building (lights, hvac), on the right is the new panel for the house. The transformer is hung on the left, in the middle is a disconnect and a surge protector, on the right is the panel for the clean power to the studios. We finally got our new main entrance. The lobby will be behind the glass and on this side will be a covered patio with some places to sit. The view from in the lobby, the whole front will be glass which gives a really great view of the outhouse. There will be a canopy over the door and a fence basically right where I’m standing that will help provide some privacy. All four of the mini-split air handlers for the studio spaces are hung in the hallway now. The air handlers are hung on rubber isolators and rubber pads at the end of the all-thread shafts. Today they started on the ductwork. Building the ducts. They are oversized and lined with fiberglass insulation. The steel for our instrument gallery/storage room showed up today. This wasn’t originally in the plans, the room was, but not the layout and the steel, but our contractor found us some savings and with it we will finish the room. The ceilings are so high that in order to take advantage of the space we are building a mezzanine. Here you can see the stairs and the deck material. Laying out the steel structure. The steel beams in place - the back of the room will be the largest part of the mezzanine, with a catwalk going down the left side. 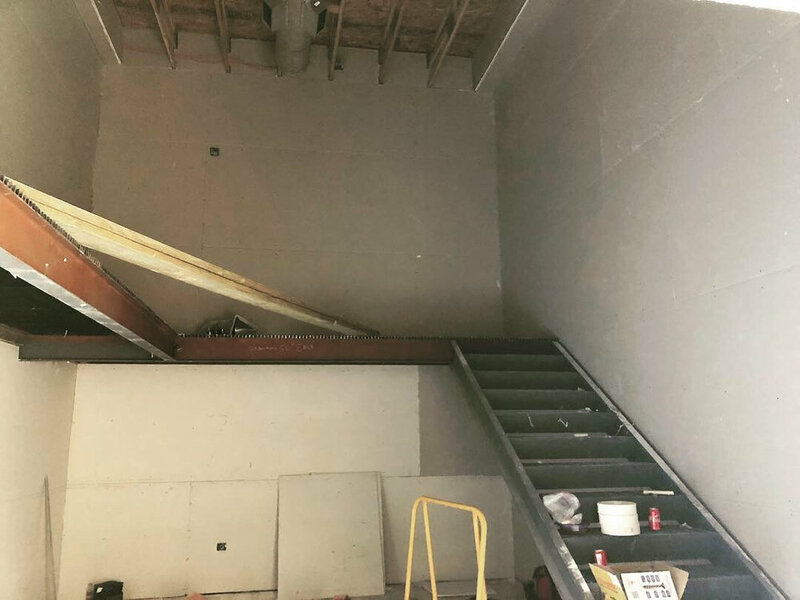 The stairs will sit on the right side agains the wall. In the past few weeks I also made the mistake of learning about the new API 2448. We currently have a 32 channel API 1608 and the plan has been to put that in the new studio 1. We typically use half our console for mic lines / front end and half for pro tools returns. The new 2448 is an inline design, meaning it has 2 input paths per channel, so we could have pro tools outputs directly above mic lines and a 32 channel console would actually yield us an additional 16 mic lines to use and an additional 16 line inputs all at the same time. So, now I’m plotting and scheming for ways to save on other equipment, current equipment we could sell and places in the construction budget where we might still find some savings. Of course the lead time on one of these consoles from API is 3-4 months, so if we want a console when the doors open we need to get on the list! More info on this to come, but if anyone is looking to buy an excellent condition, practically new API 1608 let me know! I’ve been giving a lot of tours of the construction site lately. Without fail everyone asks when we expect to be finished and ready to move in. The truth is I have no idea. At one point I was hoping it would be March, now I’m hoping it’s May, but really, no idea. Honestly, for now as long as people continue to show up and work every day I’m happy. Sheetrock began in the hallway. 2 layers of 5/8’ with staggered seems in the hallway. Both layers were taped and mudded. 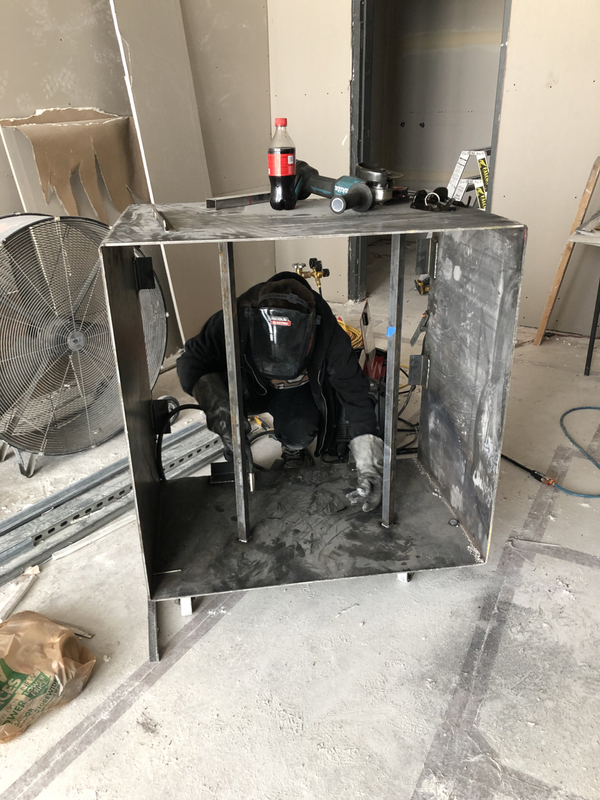 HVAC work began with some duct work in the lobby. Some careful planning allowed for the ducts to live in the trusses and buy us some much appreciated ceiling height. Some of the Samsung mini split / heat pump units. You can see the rails for hanging the hvac units. All of the electrical boxes are wrapped with putty packs to help with the integrity of the sound envelope. I know it’s kind of dumb but when these isomax clips showed up I was genuinely excited. The clips are screwed into the studs and then the hat channel hangs in the clips. 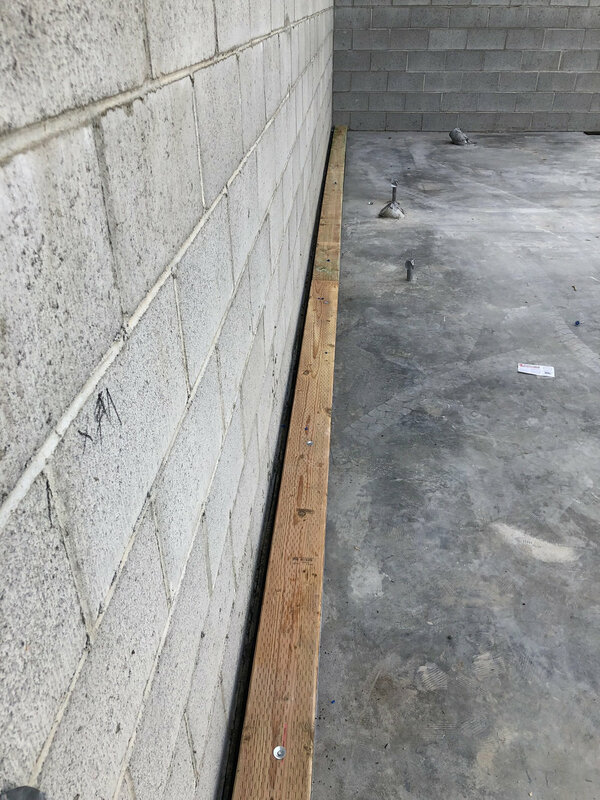 The rubber material helps isolate the sheetrock from the studs and drops the sound transmission through the walls significantly. Iso clips and channel hung in control room 1. Iso clips and channel hung in tracking room 1. Busy week and weekend in the studio, but things continued out back in the new space. 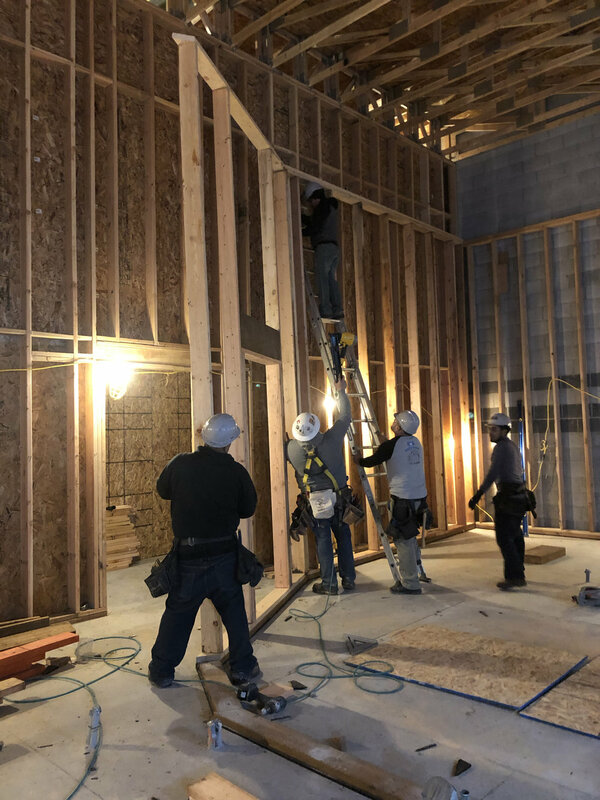 Most of the progression this week was in electrical, but there was a lot of leftover framing done, as well as many meetings regarding hvac and sheetrock. The south side wall of tracking room 1 was sheeted which does even more to show the size of rooms and how things will feel. In the center you can see the window into the control room. Looking out of control room 1, the sheeting helps show off just how large the windows will be and how great the view of the tracking room will be. The south side of tracking room 2 also got sheeting. The electricians made some headway this week. 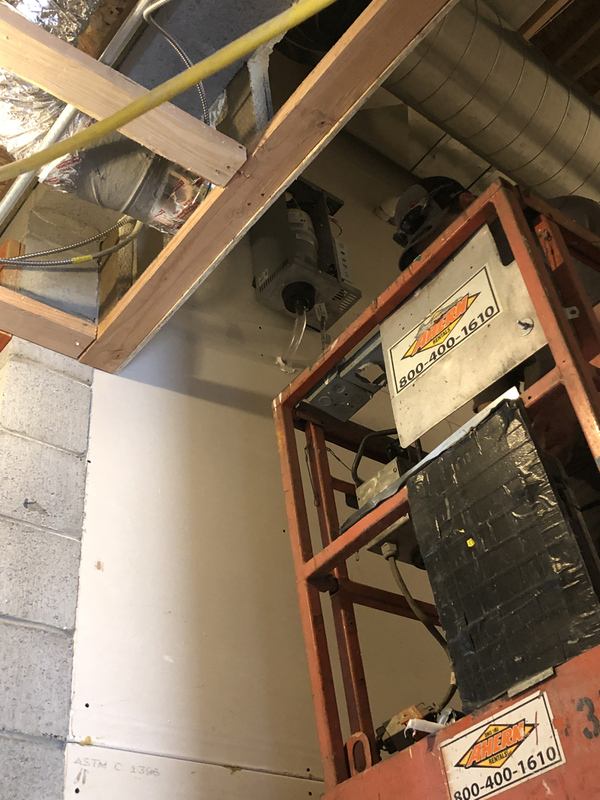 There was some discussion as to how to mount the electrical boxes and keep them isolated from the framed walls but sitting in the sheetrock and other acoustic materials which will be mounted. The solution was to use some isolation material between the mounting hardware for the electrical and the framing. Managed to get my son involved building a box for our new fire pit. Happy 2019! It has been a while since my last update, but given the holidays things slowed down considerably. Last week however that really changed. 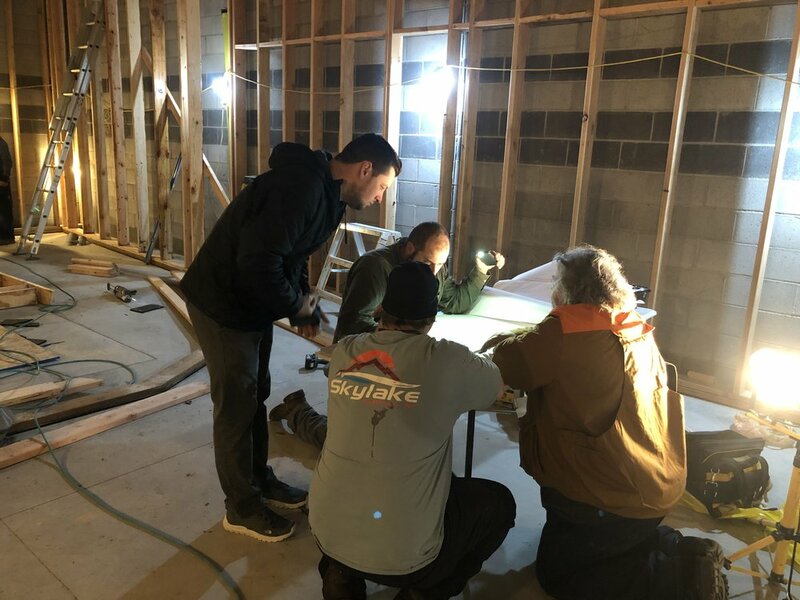 We were lucky to have Tony Brett from Brett Acoustics in from North Carolina to train the framing crew in the complex art of control room construction. 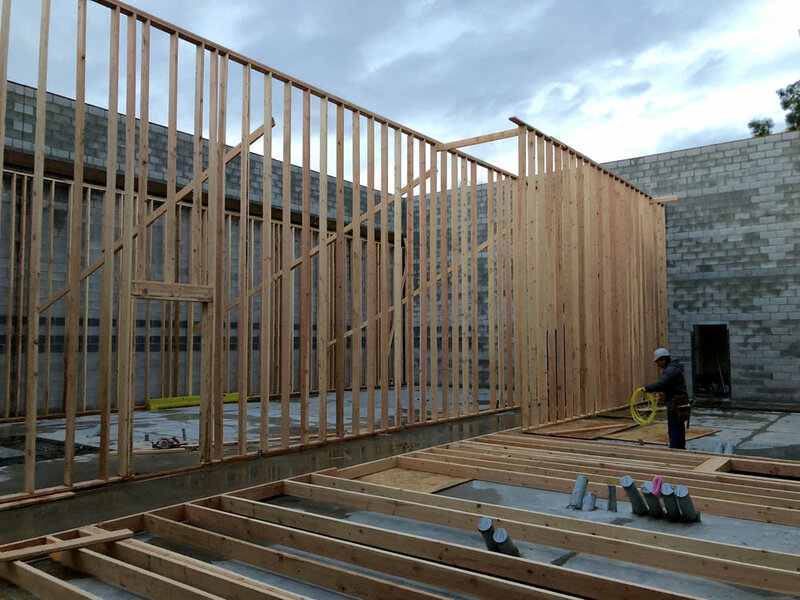 At this point most of the major framing is done so electrical / hvac and even the audio wiring should really get under way soon. The wall separating tracking room 1 and the studio 1 isolation booths. You can see all of the unused space above the booths that I mentioned in my last post. Before Christmas we had some warm weather and the landscapers continued to work out front. 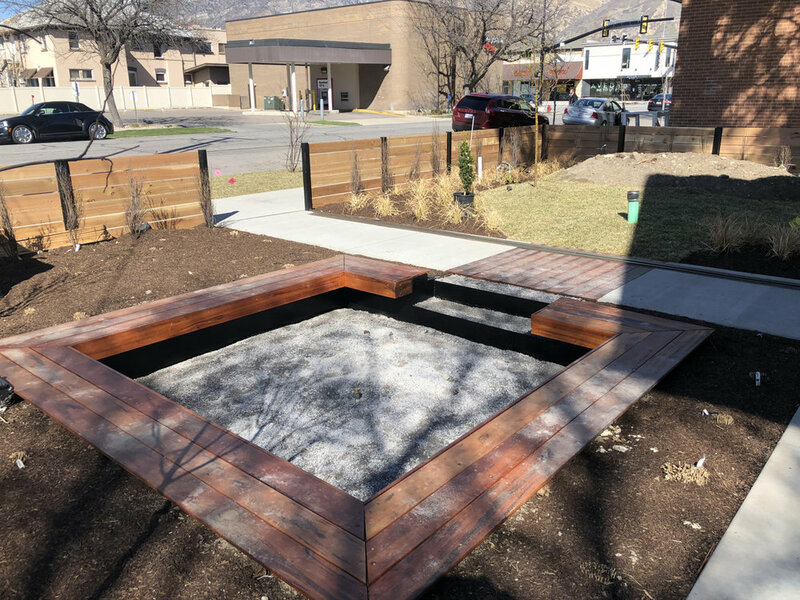 The fire pit on the left was finished and the “boardwalk” was installed. Downspouts being installed on the building just in time for some snow. Without doors the new space was open to anyone. After 1am one night an alert was sent to my phone from the canary camera I have on the back of the house. Someone was walking around and appeared to be taking interest in the tools left by the framing crew. Being unsure what his motives were I called the police and they went over to check things out. This is a screenshot from the video showing the man walking toward the policeman’s flashlight with his hands up. In the end nothing was taken and after some questions he went on his way. Needless to say we installed some doors and secured it the next day. Tony Brett flew in on January 7 and early on the 8th got to work. 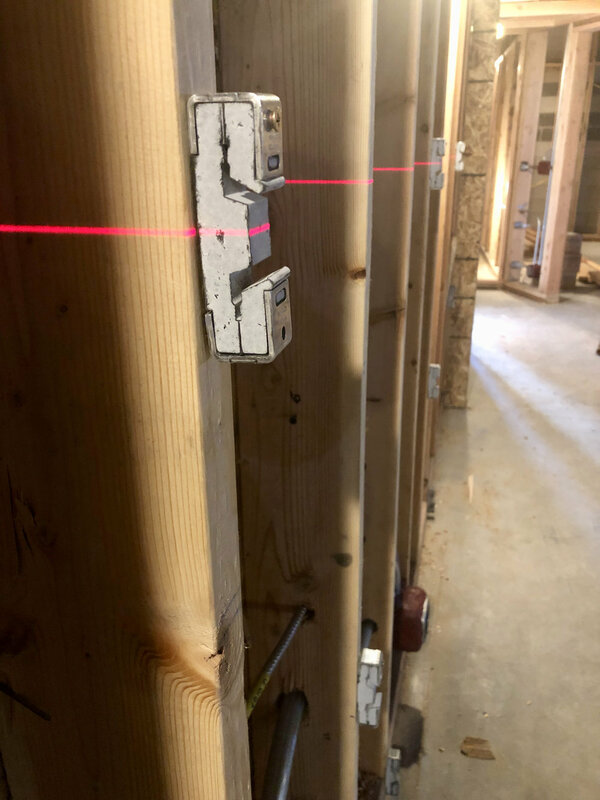 First he used a laser level to establish and layout the center line of studio 1 and then set some points to show where the walls would sit. Tony was able to shed so much light on details of the construction that were hard to pull out of the plans. I know that his onsite supervision and direction combined with Wes Lachot’s great designs are why their studios sound so great. We took advantage of his visit and had him meet with all of the subs that could come by. Raising one of the rear side walls in control room 1. The next wall up includes the door from the control room into the sound lock. Here they are making sure everything is plumb. This photo shows half of the lobby, basically what you will see when you walk in the front entrance. The stairs behind the beam were poured just after Christmas along with the pads that sit under the consoles and around the cable troughs. These pvc boxes / wire troughs sit under each of the consoles. All of the pipes that will carry audio cable around the studio terminate here. Using the laser to set the center line in studio 2 and start laying out the walls for the isolation booth. Setting the right speaker soffit wall in control room 2. The framing company had some problems getting enough guys out every day. Tony (left) and superintendent Jared (right) jumped in and helped out. The electricians started their interior work by setting the panels and getting the nylon pull tape in the conduits. This box is where the conduit for the clean power outlets terminate. The transformer that isolates the clean power will also sit on this side. Control room 2 framing nearly finished. View from tracking room side. Doors on left and right lead to sound locks and then into the control room, window in the middle and behind it you can see the block outs for the ATC monitors. Raising the first of the two walls separating the isolation booths in studio 1. Setting the left speaker soffit wall in control room 1. Looking out of one of the isolation booths into the other booths (left) and into tracking room 1 (right). The right speaker soffit wall in control room 1 and the doors leading out of the control room. The front wall of control room 2. The space between the front wall of control room 2 and tracking room 2. Tracking room 2 looking back into control room 2 and the instrument gallery behind. Setting the header for the tracking room 1 window. The front wall of control room 1 was the last thing finished on Saturday night. Front wall of control room 1. These two framers - Alejandro and Oscar - were superstars. They were acquaintances of one of the other framers and were hired last minute to come in and help out yesterday (on a Saturday) so we could get everything done before Tony returned home. They really figured out what Tony needed and were even willing to stay late after the other 11 framers had all gone home. Looking across tracking room 1 toward the control room. Everyone worked hard this week and we are in great shape to move forward. It is so exciting to see this much progress and to finally really be able to see the rooms taking shape. After everyone went home I shot a quick walkthrough video showing the state of things as we head into next week. Check it out below. Some new walls this week have started to reveal the studio spaces, it has also revealed some pretty massive areas that are unused, namely above the booths in studio 1 and above the booth of studio 2, the bathroom and the janitor closet. The space above the booths in studio 1 has close to 10’ ceilings and is roughly 25’ x 10’! Anyway, just trying to figure out if there is something useful that can be done with that space. Some ideas we have come up with; storage for the emt plates, general storage for random stuff, echo chamber(s). I’d love to do some echo chambers but it means more framing, more sheetrock or plaster, more money. Anyone else have any ideas? 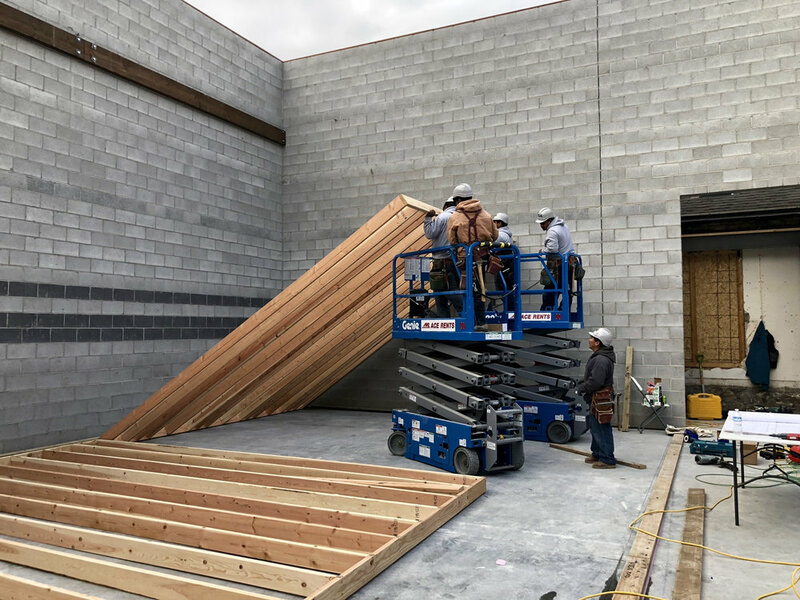 Roof for the lobby being framed. A lot of care is being taken and will be taken in how this roof ties into the old house. So far so good. Looking down Studio 1 from behind where the console will sit. The three booths at the end are starting to take shape. Looking down Studio 2 from behind where the couch will sit. You can see some of that unused space above the booth at the far end. Studio 2 has one booth in the center of the rear wall and the bathroom and janitor closet are on either side and accessed from the lobby. Today they sheeted most of the hallway between studios making it look massive. Trusses showed up and the guys got to work setting them. Once all the trusses were set over studio 1, Jared, our superintendent, realized that the framers had set nearly half of them upside down. A few hours later everything was fixed and by the end of the next day all the trusses were in place over the studio spaces. Finishing up the the rest of the titan bolts that hold the ledger board to the concrete block. Setting the OSB sheeting over the trusses. Setting the foam insulation on the roof. Rolling out the membrane over the foam, the seams are heat welded with a torch to keep things waterproof. Setting trusses in the lobby. The plan is to paint the trusses and have everything exposed but I’m second guessing that at the moment because a simple sheetrock ceiling would hide a lot of the unusual transitions between the house / lobby / studio spaces. Landscape work continues out front. This will be a step down fire pit with a bench all the way around. Hoping it will give clients and engineers a place to hang out when they need some fresh air. Our landscape designers, Planted Studio, spec’d a lot of these grasses for the edges of the property. These will grow to 6-7 feet tall and form a hedge that, along with a perimeter fence, will hopefully give us a fairly private outdoor space. Looking down Studio 1 from the booths into the future control room. Still waiting for that snow sitting where the console will be to melt. Looking down Studio 2 toward the booth. The doorway the guys are framing will be french doors into the iso booth. Looking down the hallway between studios toward the back door. OSB sheeting going up on the walls. Finally moved the time-lapse cameras so we could keep capturing the work going on within the walls. The video below is updated to show the work through November 30. I was really hoping to capture the trusses being set but due to the cold weather the batteries died quickly and the cameras were out the day before the trusses were delivered! New batteries are in now and the cameras are back on the job, just need to remember to change them more often. Happy Thanksgiving! This was a good week (week and a half) for studio building, it was cold but no rain or snow - next week’s forecast doesn’t look so good. First of all we have a floor! Working the fresh concrete in the future lobby. The plan, although it could always change, is to have concrete floors in the lobby, instrument gallery and hallways, and then wood floors in the two studios. This is looking from the back door at most of Studio 1. We ordered some pvc boxes to make up the troughs that will sit beneath the floor under the consoles. The boxes will give us a nice clean tie in to the 4’ pipes that carry the audio lines into/out of the control rooms. Unfortunately the boxes didn’t show up in time for the main slab pour, so we boxed out the area around to give us some play in the pipes and that will be poured in the next few weeks. Due to the temperature the slab had blankets over it every night for a week, removed during the day to allow for work. Here they are cutting the expansion joints and control joints between the studio spaces. The boxes arrived and the electricians set to work getting them in the ground. The boxes and gravel ready for the final slab pour. Not sure if they will do that soon or wait for a roof to be on the building so they can keep the concrete a bit warmer. Meanwhile out back there was work going on to install our oil separator and line for water drainage from the roof of the new building. It’s so exciting to get to spend thousands of dollars on concrete things that get buried in the ground. Actually its a total drag, but the city requires it so it is what it is. This was a short work week due to the holiday but a small amount of framing has begun. Next week I expect there will be a lot more framing and maybe some landscaping work out front. Things have been cooling down a lot here in Utah, todays high was 44 and the low was 24. We even had a small amount of snow the other night so we definitely need to get a roof on this place. The underground work finished up with the placement of the pipes that will carry most of the audio lines. This is Control Room 1, or A, haven’t decided which to go with. I figure its easier to call them 1, 2 and 3 or A, B and C than other names, but I'm a bit more intrigued by numbers lately, so for now…this is control room 1. 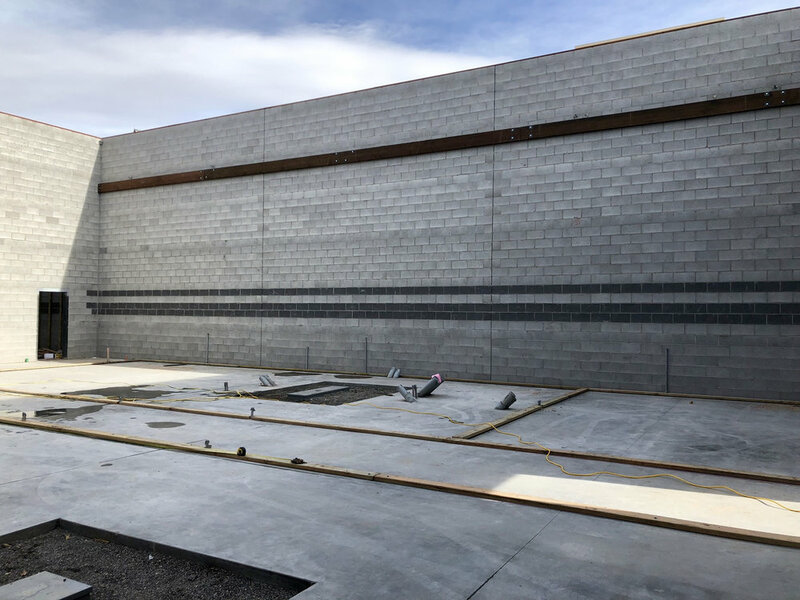 We are looking across the control room diagonally here, so the wall on the left side is the rear of the room, the pipes standing straight up on the right side of the frame will be in the front wall. 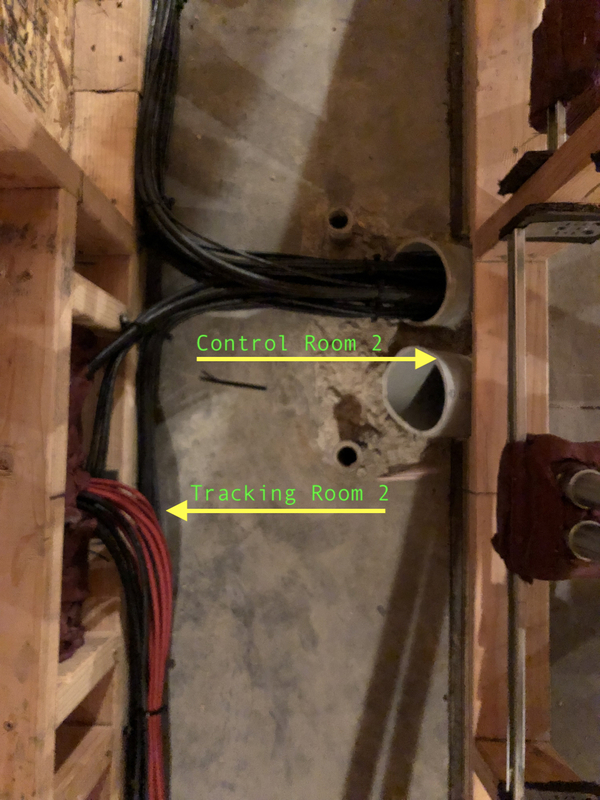 The console will sit there in the middle with a trough beneath for cable to feed into, and then you can see the various pipes leading to what I've labeled. Next this crazy truck shows up, part dump truck, part treadmill. Gravel was dumped out of the truck on to this treadmill that could go up and down, left and right and could speed up to throw gravel off at 100mph. The man on the right had a remote and just basically directed the gravel exactly where he needed it. He could get it to shoot clear across the building and land in just the spot he wanted. They raked the gravel out and made sure it got everywhere evenly, using string lines to get the elevation correct. Once they started shaping the spots for footings we got our first taste of how everything would really lay out. To be honest I’m a little surprised to find that the rooms seem smaller than I had imagined they would be, but a) I think that’s just fine, I mean after all how often do we need cavernous rooms and who am I to think I could afford them and b) our interior designer mentioned that things tend to feel smaller until spaces start to be more defined and some scale can be realized. This photo above is Control Room 2 and behind it, in the right side of the frame is our instrument storage room. This may seem minor, but to be honest this cross beam that holds up the rear corner of the old house was a big deal for me. Don’t get me wrong, when an earthquake happens I still don’t want to be in the adobe-brick turn-of-the-last-century house, but at least now I don’t need to worry that its going to just decide to fall on someone one day. With the gravel in place and the slab set to be poured, the masons showed up to fill the large hole in the back of the building. Concrete finally showed up for the front yard. It’s hard to believe how luxurious it feels to have an actual concrete path to walk on to the house, not to mention that we have a driveway to park in again! This patio in front of the new lobby will get a pergola overhead and a tall fence to enclose the area. The current plan is to get rid of the outhouse but I’m open to suggestions. The underground work continues. The smaller conduit is for power (many home-runs), the larger 4” pipe is for audio connections. The pipes he is laying out will go from the trough under the console into the credenza/rack. The ground here is very rocky which makes it difficult for running the many ground rods. 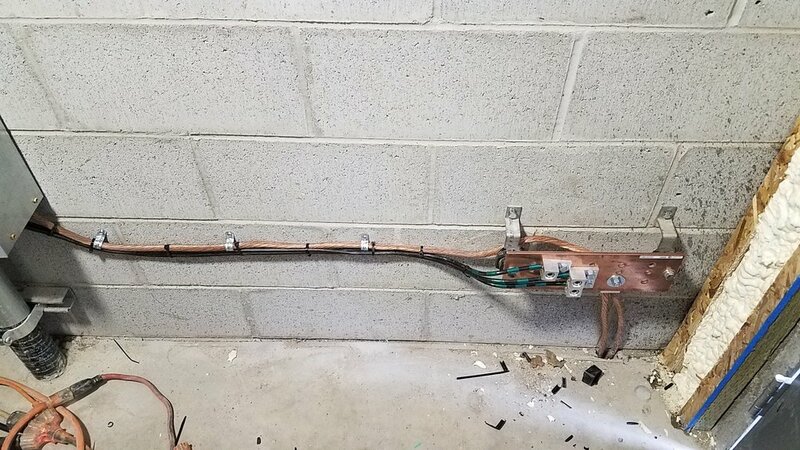 It took three guys and an electric ground rod driver to get this one in. Here you can see the all the conduit which still won’t be complete for another day or two. Ive overlayed a basic version of the plans to show where the studio rooms will lay out. The walls are finished, well, kind of. The exception is the large hole in the back wall which remains open for equipment access. The guys finishing the last bit of block for the east wall. Looking down the west side of the house, the driveway and pathways are nearly set for concrete. Looking forward to having something other than dirt for clients to walk in on! The cable coming out of the ground will feed the large transformer that the city requires. Behind you can see the beginnings of a fire pit / seating area we will be putting in the front yard. This will be the new main entrance to the studios. I was really impressed with how the masons worked around the old eaves with the block. Today the underground work started. This photo shows the plumbers tying into the new sewer line from the new janitor closet and bathroom. They finished most of their work today so the rest of the week should be the electricians who have a lot to do. We will also be running conduit to carry lines from the house into the studios and between the studios, as well as the lines that go from the racks to the consoles and the machine rooms. The new lobby on the right and the studios spaces / bathroom / janitor closet on the left. Plumbers getting the drain lines installed, door on the right is lobby into the janitor closet, door on the left is lobby into the bathroom. the large opening is lobby into the hallway which will run between studios.